Angle-cut broom is ideal for indoor sweeping tasks, especially around edges and corners. Long-lasting polypropylene bristles feature excellent stain- and moisture-resistant properties. Fuse-set construction minimizes the potential for bristle pullout. 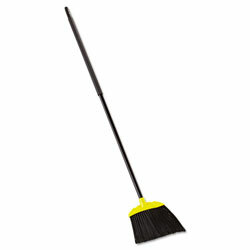 Application: Traditional Angled Broom; Bristle Material: Polypropylene; Bristle Length: 10 1/2"; Handle Material: Metal. Black Household Brooms from Rubbermaid! 206 In Stock today. The handles on these brooms are great to handle. They work wonderful in a warehouse environment like ours.